Featuring illustrated tutorials for drawing 75 different flowers, Ten-Step Drawing: Flowers breaks down each subject into 10 simple steps; moreover, all you need is a pen or pencil and a piece of paper! Handy prompts help artists by encouraging artistic individuality, as well as helpful tips for drawing other subjects not featured in the book. Ten-Step Drawing: Flowers is sure to encourage even the most reluctant amateur artist to break out a pen and paper and doodle to their heart’s content! About the Author: An artist and illustrator based in Suffolk, United Kingdom, Mary Woodin specializes in painting natural subjects and produces artwork for everything from stationery to ceramic tiles. Mary's interest in the outdoors has inspired a number of publications, including The Painted Garden Cookbook (a collection of illustrated recipes produced in her own garden) and Drawn to the Country. Her most recent clients include Waitrose, Tesco, Grand Central Publishing, and Country Living magazine. For more information, visit Mary's website: www.marywoodin.com. 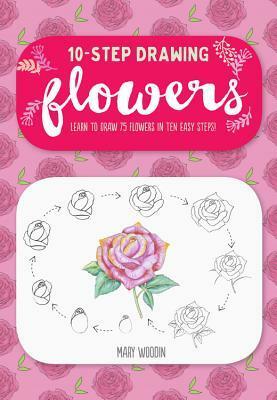 My Review: This was another great book that teaches you how to draw flowers in 10 easy steps. I have really loved drawling flowers for a while now and then this book came along and it was wonderful! My first flowers kind of looked really really weird and some of the instructions in this one were a little hard to follow. But once I really got the hang of it I really did some nice flowers. If you are looking to start drawling flowers I totally recommend this one! The instructions for the most part are pretty easy to follow and even if you cant understand part of it like I did you have step by step pictures to follow along. Do I Recommend this book? Great for the entire family! Go Into This One Knowing: Drawling flowers in 10 easy steps.